The Rockabilly Rebs came from Leeds and were a Teddy Boy Band formed in 1978. In 1979, they released an EP on their own record label, and these four tracks are available here for download. They have been dubbed from vinyl, because no master tapes exist. Unfortunately, there is also some distortion on all the 45's we've tried. This is the best we can do, and the best you'll get. Eventually, The Rockabilly Rebs were signed up by EMI and made an album. They made a second album called 'Rebels til the end' for JSP Records. 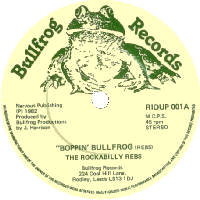 The Rockabilly Rebs also made a 45 on their own 'Bullfrog' label, and these two rare tracks are available here for download at last (also dubbed from vinyl).